A psychological horror adventure game. The developers at Zoetrope Interactive were inspired by the works of Howard Philips Lovecraft, especially the novella entitled At the Mountains of Madness. The action of Conarium takes place in the 30s, and the player find himself in Upuaut. Conarium is a horror adventure game for PC, PS4 and XONE. The production was developed by Zoetrope Interactive, a Turkish studio known from the thematically similar Darkness Within series. Creating the plot, the developers were inspired by the works of Howard Philips Lovecraft, especially the novella entitled At the Mountains of Madness, although they stress that Conarium is not its direct adaptation. The action takes place in the ‘30s of the 20th century. The story tells of a scientific expedition to Antarctica. The voyage is named Wepwawet – that derives from the name of an Egyptian deity who was known as opener of the ways. Four scientists take part in this undertaking. Their goal is to overstep the limitations of human body and mind with the use of a mysterious device, the eponymous Conarium. 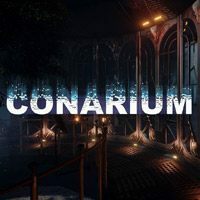 Conarium for PC, PS4 and XONE is a classical psychological horror adventure game in which we observe the events from the eyes of the protagonist. The gameplay boils down to exploring locations, having conversations, collecting items, and solving puzzles. The exploration is made more attractive by fully three-dimensional graphics that let us move about our surroundings. This element combined with the physics engine also plays a role in puzzle solving by letting us use items more realistically. Conarium is powered by Unreal Engine 4 which provided the developers with tools necessary to design detailed graphics and modern visual effects.